To make ferretto requires nothing more than a simple calcination of copper, where the metal is opened so it can impart its pigment to the glass. When this calcination is done well there is no doubt to anyone that a very interesting diversity of colors appear in the glass. This calcination may be done many ways, but I will put down two that are not only easy, but have been used by me many times for a variety of beautiful effects in the glass. The first method follows here. For Neri, "calcination" is the process of breaking a metal down into a powdered form using heat. Notice that he says the copper must be "opened" so that it can color the glass. The thinking here is that the colors are normally hidden inside the metal and that by roasting it in the furnace, the metal is "opened" and those hidden colors become exposed and available to tint the glass. 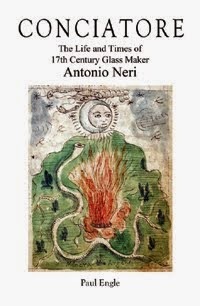 Elsewhere, Neri implies that all the colors of the rainbow are hidden in the glass itself, and that metal pigments cause certain of them to be revealed. You should get thin shims of copper the size of a florin [coin] and have one or more goldsmith's crucibles ready. In the bottom of them, you should make a layer of pulverized sulfur, then a layer of the shims, and over them another layer of pulverized sulfur, and one of copper shims, and so on. With this method, fill the crucible in what is otherwise called a stratification. Cover the crucibles, coat them well with refractory clay, dry and place in an open oven to vent amongst burning coals and put a strong fire to them for two hours. Allow them to cool and you will find calcined copper, which will come apart with the fingers, as if it were dry earth. It will rise in color to a blackish-reddishness; this copper should be ground fine, passed through a sieve and kept well secure for use in coloring glass. To Neri's mind, the result is copper that has been transformed into an "opened" state, ready to impart its color to the glass. To a modern chemist the result could be analyzed and would most likely show a mixture of copper sulfides, copper oxides and perhaps some unreacted sulfur and copper. Through a simple process he has produced a cocktail of different materials. In a very hot furnace, sulfur would tend to be driven off as toxic, smelly, sulfur dioxide gas, leaving behind copper oxides. The two prevalent copper oxides are red and black in color, as suggested by Neri's statement: "It will rise in color to a blackish-reddishness." How they would tint glass would depend on further preparation of the glass and on what temperatures were achieved in the furnace. This second way to make ferretto is much more laborious than the first; nonetheless, it will produce extraordinary effects in the glass. Instead of stratifying the copper in the crucible with sulfur, stratify it with vitriol. Now calcine it, leaving it in the furnace chamber, near the eye for three days. Remove it, stratify it again with new vitriol and leave it to reverberate as above. Repeat this calcination with the vitriol six times at which point you will have a most noble ferretto whose colors will produce extraordinary effects. "Vitriol" is a caustic sulfur compound that comes in two varieties: blue and green. When added to water, they can be described essentially as copper or iron dissolved in a sulfuric acid solution (copper for blue, iron for green). 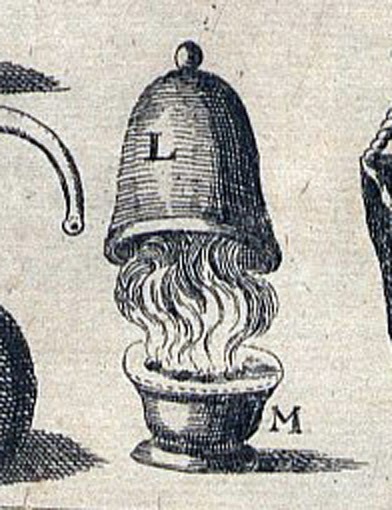 Neri does not specify which to use, green vitriol would add iron to the recipe while blue vitriol would simply increase the amount of copper. He then says to leave the preparation "near the eye for three days." The "eye" was a central hole in the furnace floor exposing the flames of the combustion chamber below; it was the hottest part of the furnace, the pots of hot glass were usually arranged around it in a circle. "Reverberation" was a term for indirect heating; in other words not directly exposed to the flames. Copper oxide in glass can produce a sky blue, a green or a vibrant red. Pure copper can make a dark ruby red color. Iron oxide creates a blue-green and, Neri claims, also a blood red. Sulfur in combination with iron makes a yellowish to amber color. Many of these colors depend not only on the glass formulation, but on the artisan who makes the finished piece. How the glass is "struck," that is: heated, cooled and reheated, can affect the color dramatically. Even today, the only sure way to see what colors are possible with this recipe is to reproduce it and experiment. Through a simple recipe for copper pigment we see just how complex glassmaking could be. Neri’s explanation of metals being "opened" to expose hidden colors is elegant. It was based on observation and it guided him and artisans to make glass creations in a wonderful range of colors. The fact that Neri’s understanding of four-hundred years ago was less accurate than our understanding today is hardly surprising. We should not be surprised at the same outcome four-hundred years from now.